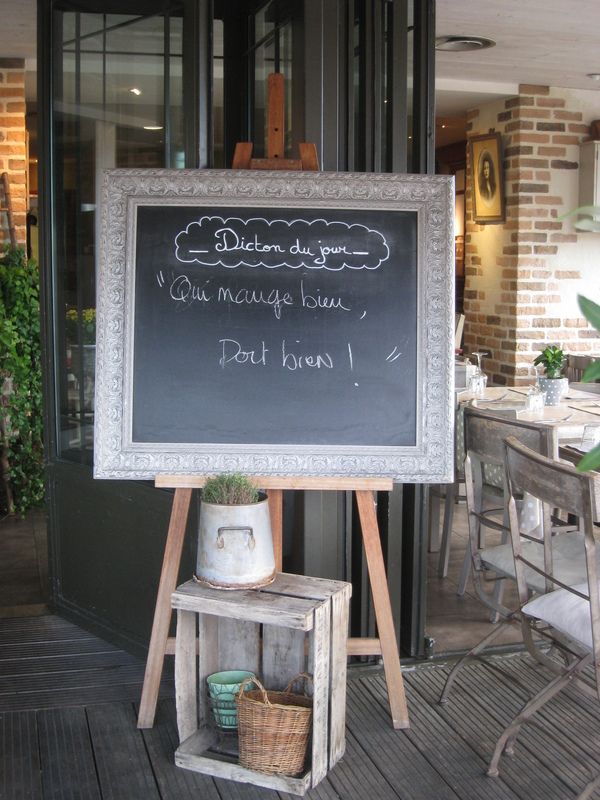 Beaches, Fish, food, France, Restaurants - let's eat chic, Travel - bon voyage!, Vive la France! It’s hot, the heat has fried any sort of decision-making mechanism that Monsieur and I might once have possessed, and we’re hungry. The afternoon has been spent squeezed onto a beach with hundreds and thousands of French holidaymakers at Les Sables d’Olonne in the Bay of Biscay and we’d prefer not to spend the evening looking out at the scene of the crime, so we walk around to the port-side of the town, noses to the ground, sniffing out an eatery worthy of our time and money. After much deliberation, we settle on a restaurant called Les Fleurs du Thym. It’s at once chic and modern, with a nostalgic air. We take a table, just before the throngs in the know arrive to fill the place. I take the €26.00 menu, while Monsieur dives into the more pricey, €36.90 menu. Ouch. This had better be good. Our starters arrive. Mine is a seafood platter, with everything fresh from nearby waters. The oysters are served with a white wine vinegar and shallot dressing, which I spoon liberally across them before gulping down the still-breathing molluscs and proceeding to twiddle a little needle inside sea-snail shells to extract the slippery flesh. The langoustines are good, if messy, and the small tartine of smoked salmon tasty. Only the deep-fried calamari rings taste like something you could probably do better at home. They’re soggy, lifeless, non-descript. 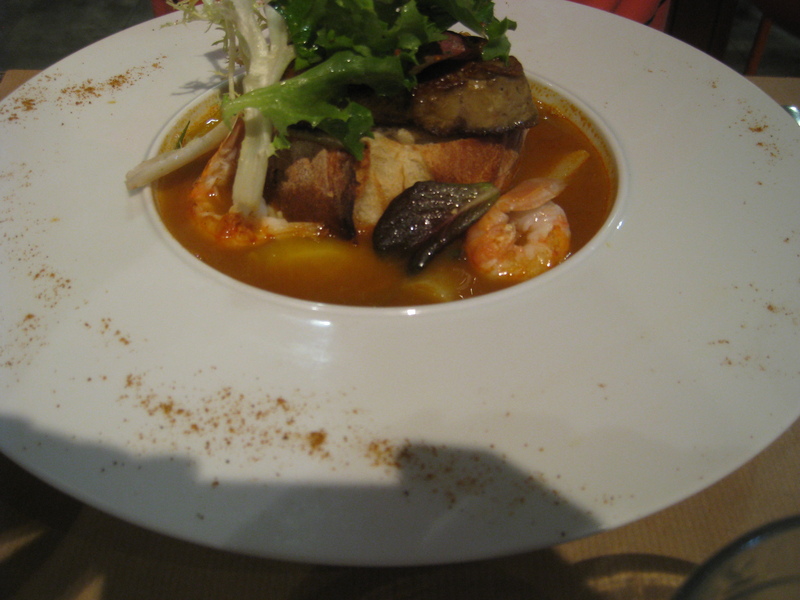 I ask Monsieur about his Minestrone, which intrigued with its exotic inclusion of langoustines and foie gras. “Taste it,” he commands, “dishwater is better.” I hope this isn’t said from experience and think he’s overreacting until a spoonful of soup slips down my throat. The liquid is embarrassingly dull, the vegetables screaming out for decent stock in which to soak. I don’t know how he manages to finish it, so bland it is – and on the more expensive menu! We move onto our main courses, which appear swiftly. 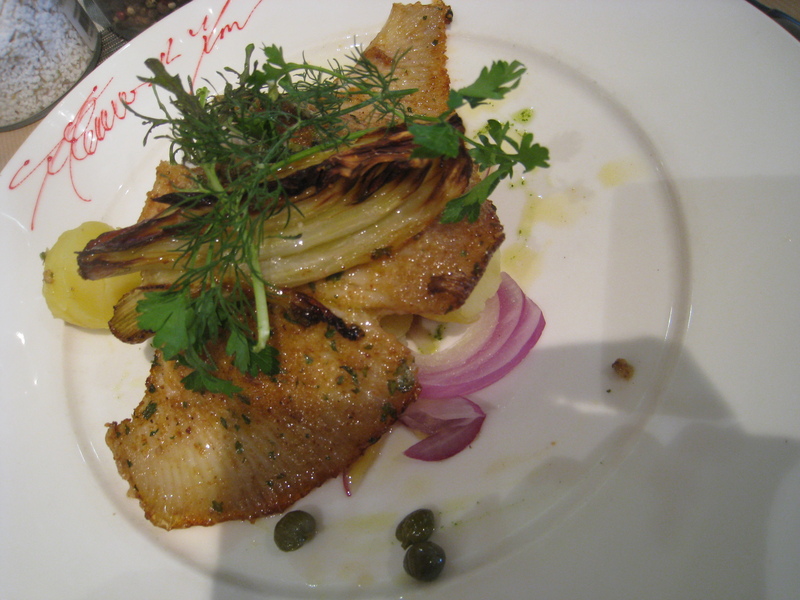 Mine is skate, delicate and soluble on the palate, with a lovely tang of buerre blanc swimming with baby capers. Roast fennel finishes the picture. On such a warm evening, this is an ideal dish – not too heavy. Pity poor Monsieur across from me, though. He’s ordered the riz de veau. Offal of various shapes and forms hits his side of the table, most of it far from his taste. For the more expensive menu, I’m shocked: minestrone and offal are certainly cheap dishes to make, so the restaurant must be making a killing on the profit. 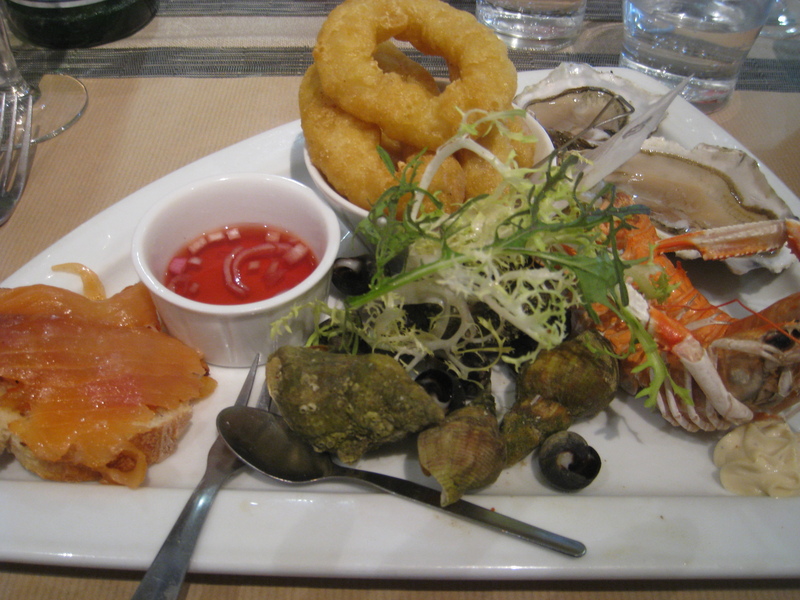 I’ve ordered a seafood platter and delicious fish, yet my meal is a whole €10.00 cheaper. Surely, the management has mixed up the prices? The dessert course is now under pressure to perform. 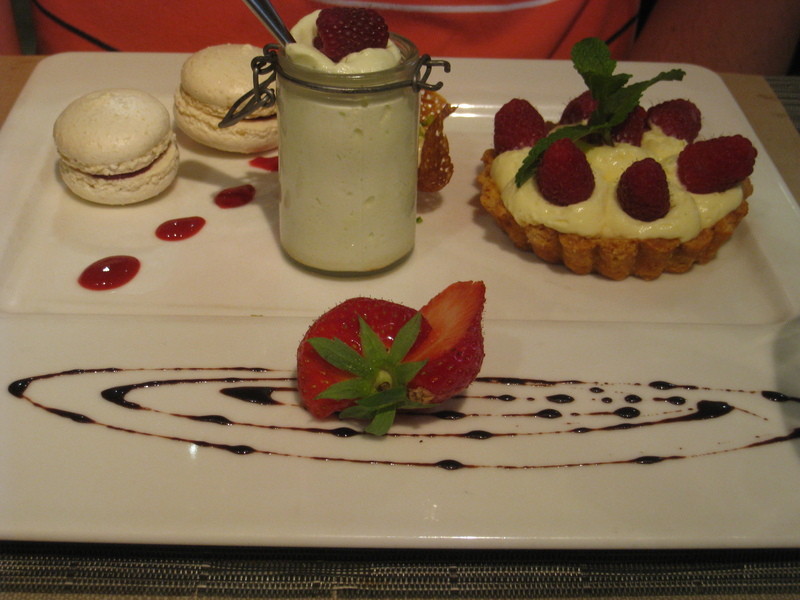 My fingers cross and remain quite paralysed until a pair of beautiful sweet plates are set before us. 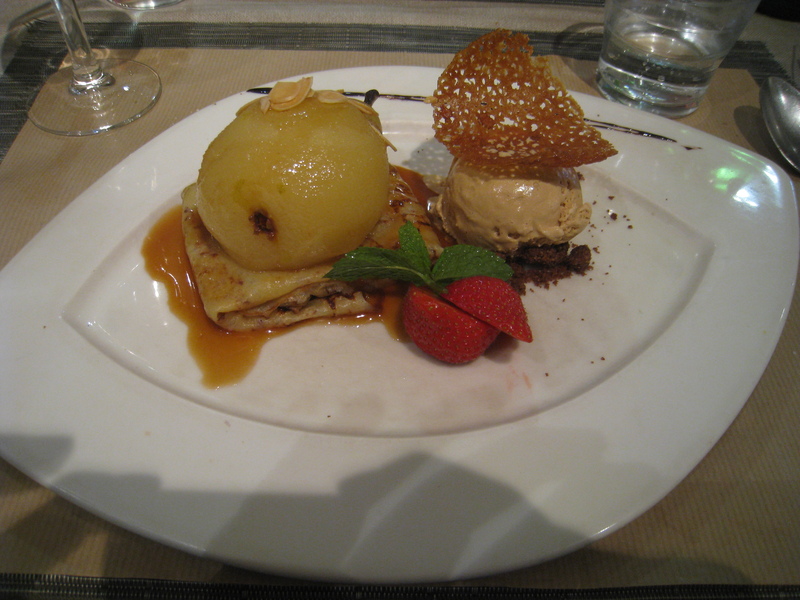 Once more, my fortune holds and before me is a pile of goodness – a steaming Breton crêpe, crowned with a stewed whole pear, all sticky and soaking with a subtle, walnut butter sauce. For once, my husband draws a lucky card: his thus-far frustrated palate will now be soothed by a perfect round of raspberry tart, fresh strawberries, berry-flavoured macarons, a berry-filled brandy snap basket and (wait, there’s more) a small preserving jar oozing with mint-flavoured chantilly, topped with a raspberry. The moral of this dining story? The more expensive set menu doesn’t necessarily provide better value. Yes, we’d return to Les Fleurs du Thym, should we ever find ourselves in Les Sables d’Olonne again, but next time we’d stick to the cheaper menu. On this occasion we’d experienced that rare thing in restaurants, where paying less most definitely delivered more. Lesson learnt.